The Capacity Storage Range by Pinnacle has a number of unique features to increase durability and enhance speed, ease of installation and access to services. The products have been tested by FIRA to meet the most demanding standards. 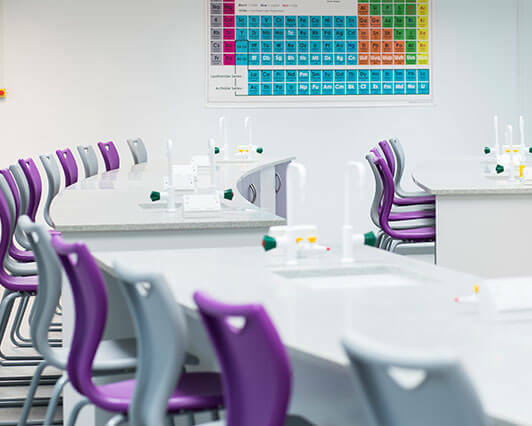 Pinnacle Furniture are an educational furniture manufacturer with a comprehensive range of fitted storage specifically designed for science laboratories and technology spaces. The Capacity Storage Range has a number of unique features to increase durability and enhance ease of installation and services access and the products have been tested by FIRA to meet the most demanding standards. The collection provides a wide range of colours and finishes including numerous worktops that are tested for chemical and impact resistance including SGL, Velstone and Iroko. 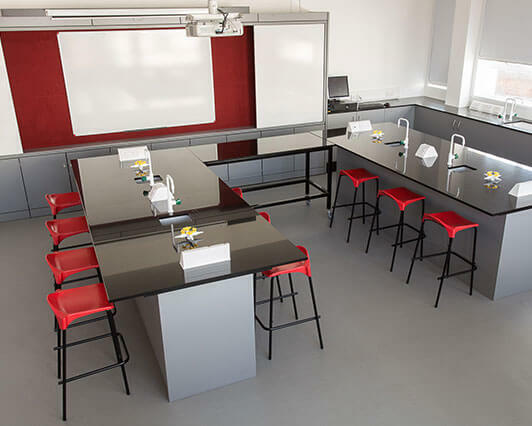 One of the key aspects to consider for durability and aesthetics in any teaching environment is the worksurface. 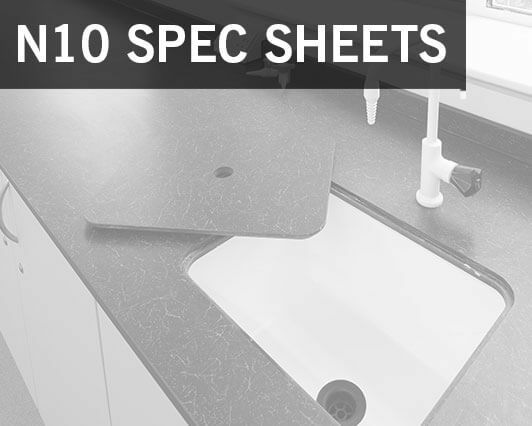 The following material ranges are proven surfaces that can be machined for any use. 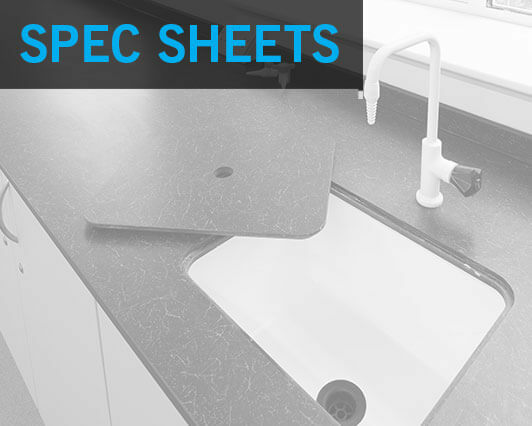 An impermeable and acid resistant work surface. Velstone is a 25mm solid composite stone surface, it isn’t bonded onto any substrates. This ensures a heavy quality product with proven acid and stain resistance. Like other composite stones it has a seamless surface with no dirt on joint lines and it ensures longevity of life as it can be easily maintained by sanding. A traditional laboratory surface it is available in 25mm thickness and is a popular choice for its properties to resist impact and water as it is a very dense hardwood. Maintenance by sanding and refinishing ensures longevity. Dedicated teachers work area with options for all services including fume cupboard docking stations. Science service pedestals allow for flexible room layouts while providing services to multiple students at one time. The pedestals can be chosen with all worktops and can incorporate power, gas taps and sinks. The Capacity Storage Range by Pinnacle Furniture is a specifically designed storage system for education, it has a number of uniquely designed features to ensure maximum lifespan and practicality. All our units are FIRA tested to BSEN16121:2013 Level 2 Extreme Contract Use and have 170° hinges with additional strengthening hinge plates. The carcass colour is light grey and all units have a removable 8mm back to enable access to services. The Capacity Storage Range by Pinnacle Furniture has a number of Shallow Base Units which are often used in peninsular or island arrangements where knee spaces are required. All the units in the range are specifically designed for education, and have a number of uniquely designed features to ensure maximum lifespan and practicality. All our units are FIRA tested to BSEN16121:2013 Level 2 Extreme Contract Use and have 170° hinges with additional strengthening hinge plates. The carcass colour is light grey and the units have non-removable backs as the access for services is normally on the reverse of an island. Service Void Units from the Capacity Storage range are shallow and primarily used in peninsular or island arrangements. A service void along the top of the doors is required to enable gas and power to be run to the worktop. All the units in the range are specifically designed for education, and have a number of uniquely designed features to ensure maximum lifespan and practicality. All our units are FIRA tested to BSEN16121:2013 Level 2 Extreme Contract Use and have 170° hinges with additional strengthening hinge plates. The carcass colour is light grey and the units have non-removable backs as the access for services is normally on the reverse of an island. The Capacity Wall Units marry up with the base unit dimensions in the Capacity Range for uniformity. All wall units are FIRA tested to BSEN16121:2013 Level 2 Extreme Contract Use and have 170° hinges with additional strengthening hinge plates. The carcass colour is light grey and the units have non-removable backs. The following Capacity Units are specifically designed for classroom use, they are made to the same stringent test standards as the rest of the Capacity Storage Range and have a grey carcass as standard. A range of handle options are available to give your storage a unique finish or match in with other furniture. The following services are frequently used both in science laboratories and in Art, DT and Food Technology environments. All the products are specifically selected for use within the educational environment. Drainage grooves are cut directly into the work surface on site. Allowing the liquids to naturally drain away without pooling or warping the work surface. The following range of laboratory services has been specifically selected for use within the educational environment and compliance with CLEAPPS BB80 regulations. Resin laboratory sinks come in a range of sizes and have become increasingly popular due to their superior chip and impact resistance than traditional ceramic sinks. All gas and water taps have anti-twist security fixings and are specialist educational fittings. Fume cupboards are excellent ways to conduct experiments which may release harmful gases. The cupboard contains the fumes and deals with them in a safe and environmentally friendly way. Docking stations are a robust lockable enclosure housing water, gas, drainage and power connections which enable quick release connections when the mobile fume cupboard is not in use or is to be moved to a different location. The height adjustable desk range is used extensively across all teaching areas in education. Primarily used for DDA compliance, the flexibility in height allows workstations to be used at the same height as the other work surfaces in the absence of disabled users.